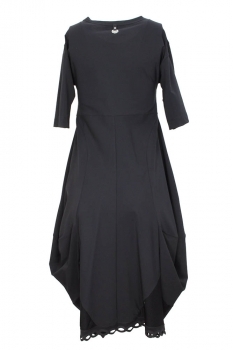 High 'Astonish', half length sleeved, black, stretch dress (High Tech). Round neck with trim. Tulip shaped. Panel construction with curved panels at each side and 2 pockets, each with single metal stud detail. Airtex insets at each side above hem at front and rear. Curved hem with double wave trim. Wonderful dress, easy to wear, stunning look!